It happens without warning: At a folk-rock show at her son’s college, Lily becomes transfixed by the guitarist’s unassuming onstage presence and beautiful playing—and with his final note, something within her breaks loose. After the concert, Lily returns to her comfortable life—an Upper West Side apartment, a job as a videographer, and a kind if distracted husband—but she can’t stop thinking about the music, or about the duo’s guitarist, JJ. Unable to resist the pull of either one, she rashly offers to make a film about the band in order to gain a place with them on tour. But when Lily dares to step out from behind her camera, she falls deep into JJ’s world—upsetting the tenuous balance between him and his bandmate, and filling a chasm of need she didn’t know she had. Captivating and provocative, Play for Me captures the thrill and heartbreak of deciding to leave behind what you love to follow what you desire. Céline Keating is the author of two novels, Layla and Play for Me. 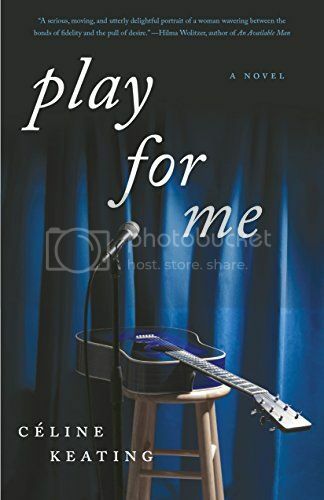 Play for Me was a finalist in the International Book Awards, the Indie Excellence awards, and the USA Book awards. Her short fiction has been published in many literary journals, and she was the first-place winner in the Hackney Literary Awards for short fiction for 2014. Keating is also a music journalist and plays classical guitar.